Your first step to setting up your notification is going to be naming it, you can name it anything you’d like we would recommend naming it something easily identifiable like missed calls or voicemails. Next you’ll need to decide how and when you’d like to receive the notification. There is a “do NOT send an email if there are zero (0) matching calls” option. This is for summary notifications, you can choose whether or not you’d like to receive the notification even if there is no information to report. You may want this turned on for consistency purposes or turned off if you don’t want to receive a notification of zero calls. 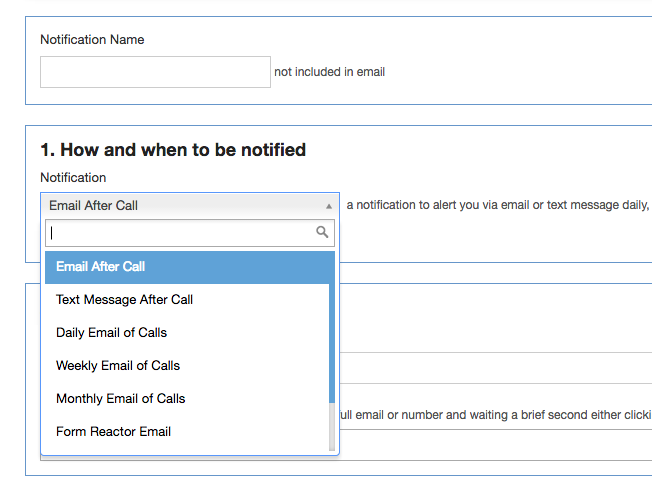 In the first box you’ll enter the subject of the email, for example New Voice Mail or New Form Reactor lead. In the Second box you’ll input what email address(es) or phone number(s) you’d like to send the notification too. Call Direction Will Trigger a notification based on the direction of the call. Inbound or outbound. In this section you have to options of what information you’d like to include in your notification. The items on the right are the information you’d like to include and the items on the left are the information you’d like to exclude from the notification. Simply click to move the selected item from one side to the other. Step 5: Notification language. Select the language you’d like the notification to be in. Step 6: Preview your notification. Here you can preview your notification. There also is a switch for turning on or off Auto lead format. This is a service for the automotive industry, if you are not in the automotive industry leave this option off.